Terra Nova was a whaler and polar expedition ship. She is best known for carrying the 1910 British Antarctic Expedition, Robert Falcon Scott's last expedition. Terra Nova (Latin for New land) was built in 1884 for the Dundee whaling and sealing fleet. She was ideally suited to the polar regions and worked for 10 years in the annual seal fishery in the Labrador Sea, proving her worth for many years before she was called upon for expedition work. In 1903, she sailed in company with fellow ex-whaler SY Morning to assist in freeing the National Antarctic Expedition's RRS Discovery from McMurdo Sound. On return to the Great Britain, expedition leader Commander Robert Falcon Scott was promoted to the rank of captain. 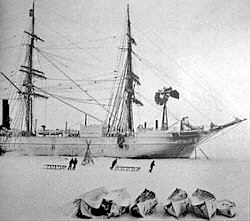 On return from the Antarctic, Terra Nova was purchased by the American millionaire William Ziegler and placed under the command of a Norwegian, Captain Johan Kjeldsen. She sailed to the Arctic to return members of the US Fiala/Ziegler expedition from Franz Josef Land to Norway. This expedition had lost its ship America, crushed by ice, during an attempt to reach the North Pole. After returning to Newfoundland in 1906, Terra Nova resumed sealing duties with her owners, C. T. Bowring & Co. of St. John's and Liverpool. In 1909, Terra Nova was bought by Captain R.F. Scott RN for the sum of £12,500, as expedition ship for the British Antarctic Expedition 1910. Reinforced from bow to stern with seven feet of oak to protect against the Antarctic ice pack, she sailed from Cardiff Docks on 15 June 1910 under overall command of Captain Scott. He described her as "a wonderfully fine ice ship.... As she bumped the floes with mighty shocks, crushing and grinding a way through some, twisting and turning to avoid others, she seemed like a living thing fighting a great fight". Although the twenty-four officers and scientific staff made valuable observations in biology, geology, glaciology, meteorology, and geophysics along the coast of Victoria Land and on the Ross Ice Shelf, Scott's last expedition is best remembered for the death of Scott and four companions. After wintering at Cape Evans on Ross Island, Scott, Henry Bowers, Edgar Evans, Lawrence Oates, and Edward Wilson set out on a race to be the first men at the South Pole. Starting with tractors and Mongolian ponies, the final 800 miles (1,300 km) had to be covered by man-hauling alone. Reaching the South Pole on 17 January 1912, they found that Roald Amundsen's expedition (based on Fram) had beaten them by thirty-four days. Worse was to come, as all five men died on the return journey. The frozen bodies of three were discovered eight months later, in November 1912. Their journals and papers were found and retrieved. After returning from the Antarctic in 1913, Terra Nova was purchased by her former owners and resumed work in the Newfoundland seal fishery. Estimates for her career as a sealing vessel is over 800,000 seal pelts.In 1918 she was charted by DOSCO to transport coal from the coal mines at North Sydney to Bell Island. She also assisted at the disaster of the SS Florizel in February 1918. In 1942, Terra Nova was chartered by Newfoundland Base Contractors to carry supplies to base stations in Greenland. On 12 September 1943 at 2205, the vessel sent an SOS reporting damage, that water was over the boilers and pumps were not working. The US Coast Guard Cutters Atak, Amarok, Laurel, and Manitou, all part of the Greenland Patrol of the US Atlantic Fleet, responded. Atak reached Terra Nova on 13 September. They rescued all personnel aboard and set the ship alight before proceeding to Narsarssuak, Greenland. Amarok and Manitou turned back after their services were not needed. Laurel proceeded to the site of Terra Nova. The burning hulk was sunk by gunfire at 1625 on 13 September at 60° 15′ 15″ N, 45° 55′ 45″ W.
The figurehead from Terra Nova was removed in 1913 and sent to the National Museum of Wales. Her bell is kept at the Scott Polar Research Institute, part of the University of Cambridge. It was given to the Institute on 20 October 1952 by Lady Nicholson of Eden, who was given the bell by her nephew, EL Atkinson, the surgeon on Scott's last expedition. The bell is rung every weekday at 10.30 and 16.00 when everyone working within the Institute is invited to gather for coffee in the morning and tea in the afternoon, as is the British tradition. It is rung in the manner of a ship's watch, five bells in the morning and eight bells in the afternoon. The binnacle of Terra Nova is displayed in the Pierhead Suite of the Pierhead Building, Cardiff Bay, a short distance from the point where Scott's crew departed Cardiff on the fated voyage. In July 2012, the wreck of Terra Nova was discovered by the Schmidt Ocean Institute’s flagship RV Falkor. ^ "Terra Nova - Ships of the Polar Explorers". Cool Antarctica. Retrieved 12 November 2012. ^ Charles Turley. "1 Through Stormy Seas". The Last Expedition. p. 3. Retrieved 12 November 2012. ^ "Terra Nova Model Ship | Museum Quality". The Model Shipyard. Retrieved 28 February 2018. ^ "Declassified war diary of the Greenland Patrol from the National Archives" (PDF). Retrieved 28 August 2012. ^ "R/V Falkor discovery of S.S Terra Nova". Retrieved 15 August 2012. ^ Rincon, Paul (16 August 2012). "Scott's wrecked ship Terra Nova found off Greenland". BBC News. BBC. Retrieved 16 August 2012. Michael C Tarver (2006). SS Terra Nova (1884 - 1943) From the Arctic to the Antarctic Whaler, Sealer and Polar Expedition Ship. Brixham: Pendragon Maritime Publications. ISBN 978 0955220807. Wikimedia Commons has media related to Terra Nova. Captain Robert Falcon Scott, was a British Royal Navy officer and explorer who led two expeditions to the Antarctic regions: the Discovery Expedition of 1901–1904 and the ill-fated Terra Nova Expedition of 1910–1913. On the first expedition, he set a new southern record by marching to latitude 82°S and discovered the Antarctic Plateau, on which the South Pole is located. On the second venture, Scott led a party of five which reached the South Pole on 17 January 1912, less than five weeks after Roald Amundsen's Norwegian expedition. A planned meeting with supporting dog teams from the base camp failed, despite Scott's written instructions, and at a distance of 150 miles from their base camp and 12 miles from the next depot, Scott and his companions died. When Scott and his party's bodies were discovered, they had in their possession the first Antarctic fossils ever discovered. The fossils were determined to be from the Glossopteris tree and proved that Antarctica was once forested and joined to other continents. RRS Discovery is a barque-rigged auxiliary steamship built for Antarctic research, and launched in 1901. She was the last traditional wooden three-masted ship to be built in the United Kingdom. Its first mission was the British National Antarctic Expedition, carrying Robert Falcon Scott and Ernest Shackleton on their first, and highly successful, journey to the Antarctic, known as the Discovery Expedition. After service as a merchant ship before and during the First World War, Discovery was taken into the service of the British government in 1923 to carry out scientific research in the Southern Ocean, becoming the first Royal Research Ship. The ship undertook a two-year expedition - the Discovery Investigations - recording valuable information on the oceans, marine life and being the first scientific investigation into whale populations. From 1929 to 1931 Discovery served as the base for the British Australian and New Zealand Antarctic Research Expedition under Douglas Mawson, a major scientific and territorial quest in what is now the Australian Antarctic Territory. On her return from the BANZARE, Discovery was moored in London as a static training ship and visitor attraction until 1979 when she was placed in the care of the Maritime Trust as a museum ship. After an extensive restoration Discovery is now the centrepiece of a visitor attraction in the city where she was built, Dundee. She is one of only two surviving expedition ships from the Heroic Age of Antarctic Exploration, the other being the Norwegian ship Fram. Edward Adrian Wilson FZS was an English physician, polar explorer, natural historian, painter and ornithologist. Petty Officer Edgar Evans was a Welsh naval seaman and member of the "Polar Party" in Robert Falcon Scott's ill-fated Terra Nova Expedition to the South Pole in 1911–1912. This group of five men, personally selected for the final expedition push, attained the Pole on 17 January 1912. The party perished as they attempted to return to the base camp. Admiral Edward Ratcliffe Garth Russell Evans, 1st Baron Mountevans, known as "Teddy" Evans, was a British naval officer and Antarctic explorer. SS Southern Cross was a steam-powered sealing vessel that operated primarily in Norway and Newfoundland and Labrador. The Terra Nova Expedition, officially the British Antarctic Expedition, was an expedition to Antarctica which took place between 1910 and 1913. It was led by Robert Falcon Scott and had various scientific and geographical objectives. Scott wished to continue the scientific work that he had begun when leading the Discovery Expedition to the Antarctic in 1901–04. He also wanted to be the first to reach the geographic South Pole. He and four companions attained the pole on 17 January 1912, where they found that the Norwegian team led by Roald Amundsen had preceded them by 34 days. Scott's entire party died on the return journey from the pole; some of their bodies, journals, and photographs were found by a search party eight months later. The Pierhead Building is a Grade I listed building of the National Assembly for Wales in Cardiff Bay, Wales. It stands as one of the city of Cardiff's most familiar landmarks and was built in 1897 as the headquarters for the Bute Dock Company. Robert Forde was an Antarctic explorer and member of the Terra Nova Expedition under Captain Robert Falcon Scott from 1910–1912. HMNZS Endeavour was a Royal New Zealand Navy Antarctic support vessel. She was the first of three ships in the Royal New Zealand Navy to bear that name. Quest, a low-powered, schooner-rigged steamship that sailed from 1917 until sinking in 1962, is best known as the polar exploration vessel of the Shackleton–Rowett Expedition of 1921-1922. It was aboard this vessel that Sir Ernest Shackleton died on 5 January 1922 while the vessel was in harbour in South Georgia. Prior to and after the Shackleton-Rowett Expedition, Quest operated in commercial service as a seal-hunting vessel or sealer. Quest was also the primary expedition vessel of the British Arctic Air Route Expedition to the east coast of the island of Greenland in 1930-1931. The Schmidt Ocean Institute is a non-profit private foundation focused on oceanography, founded in March 2009 by Eric Schmidt and Wendy Schmidt. The Institute’s goal is to advance ocean exploration, discovery, and knowledge using technological advances, data-rich observation and analysis, and open sharing of information. Scotia was a barque that was built in 1872 as the Norwegian whaler Hekla. She was purchased in 1902 by William Spiers Bruce and refitted as a research vessel for use by the Scottish National Antarctic Expedition. After the expedition, she served as a sealer, patrol vessel and collier. She was destroyed by fire in January 1916. MV Norsel was a Norwegian sealing ship home ported in Tromsø. Launched during the final weeks of the Second World War as Lyngdalsfjord and only completed in late 1949, the ship sailed in both Arctic and Antarctic waters for more than 53 years until shipwrecking off the coast of Norway in 1992.